Play Samurai™ online for free now! This exceptional slot is all about the proud Japanese elite warriors. 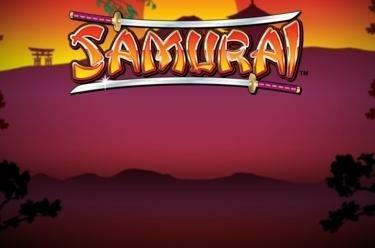 The revamped version of the cult game Samurai™ blends classic casino vibes with a contemporary look. The rules are simple: 3 reels and one (main game) or 27 (top game) win lines –and risk-takers are rewarded with winning multipliers! Fancy finding out? Landing 3 matching symbols in the main game on the central win line fills your coffers with Twists. Your winning chances increase in the top game with 27 win lines (see explanation below). Moreover, 2 Lemon and Cherry win line symbols already reward you with Twists! 3 Dragon symbols (Scatter) earn you a random Mystery win in the main as well as the top game. Bets: 1, 2, 3, 4 or 5 coins (adjustable with the button “Bet/Risk Selection”) – multipliers increase with the bet amount. Mystery wins possible (3 Scatter). Max. 2 reels can be frozen (with the button “Stop”). After wins coins can be moved to the Super Game display (“To Super Game” button). This way you can pile up bets for your top game spins! Bets: 10, 20 or 30 coins from the “Super Game” display (adjustable with the button “Bet/Risk Selection”) – multipliers increase with the bet amount. Samurai Games: Collect Samurai symbols (3 Samurai images in the same color) in the top game to trigger free games. During free games each Samurai symbol earns you 5-times your bet! 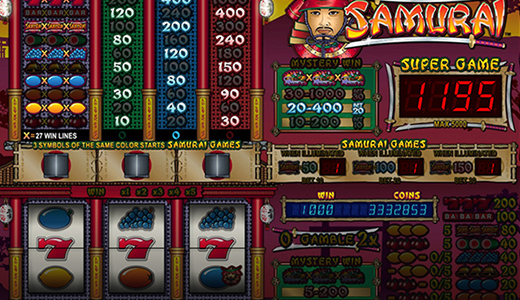 The refurbished slot classic Samurai™ looks and feels incredible and offers you unbelievable freedom of choice regarding bets and gameplay!